One of the pleasures of writing historical fiction is the chance to explore the way places were hundreds of years ago, so, as part of my background research for A Knight's Enchantment, I paid a visit to the West Country. Templecombe, where some of my scenes are set, is one of those thousands of English villages with a quiet present and a busy past, sitting in a land of wide green valleys and warm golden stone on the Somerset/Dorset border with the abbey towns of Shaftesbury to the east, Sherborne to the west and Bath to the north. A main road cuts through it, trains belting along the main line between London and Penzance occasionally stop at its tiny station, and that, to the casual eye, appears to be about it. Go back a thousand years and the place is different. Domesday Book records that Odo of Bayeux was given the land around here by his half-brother William I of England, the Conqueror, and a century later, in 1185, his descendent Serlo fitz-Odo gave part of it to the Knights Templar. 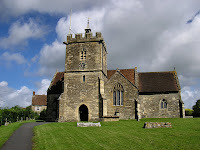 Since the Templars were not only a monastic order but a fighting one, they needed not only a church (St. Mary's, at the top of the village) and a preceptory for spiritual training (where a seventeenth-century building, Manor House, now stands on the High Street), but space for military manoeuvres, sword play, working with warhorses. No sign of this remains, though the archaeologists of Channel Four's Time Team programme spent a frenzied few days in 1996 trying to discover more evidence for the Templars' activities. In spite of the importance of Templecombe to the Order, which used it as a base for Templars throughout the West Country, their habits of frugality, modesty and secrecy have left little behind, except for one thing. In the 1950s a painting came to light hidden in the roof of a local cottage. Dated to around 1280 AD, it shows the face of a man, possibly Christ or John the Baptist. Wow! I love reading your posts! The face resembles the face on the Shroud of Turin. How interesting! Hi Julia - yes the face does look like that on the Shroud of Turin! You're so right! It is very intriguing. This is a fantastic post, Lidnsay! I love your research! Me too! I love your research. There is so much most of us don't know about the Templars and their time period. Information that would astound the world, if it only knew.